After Li Yuan established the Tang dynasty (see chart) he enfeoffed his son Li Shimin as Prince of Qin and also appointed him Chief Guardian of the Emperor. In this capacity (i.e., before Li Yuan abdicated, allowing his son to become the Tang dynasty Taizong emperor in 626), in order to promote good government after the unrest accompanying the change of dynasty, Li Shimin brought together 18 scholars to advise the government. He appointed Du Ruhui (Wiki) to be first among them. During the reign of the emperor Tang Xuanzong (r. 713 - 756) this group was formally organized as the Hanlin Academy (Wiki). Joining the academy became known as called "ascending Yingzhou". The style and content of this melody is quite strikingly similar to another one from this period, Great Ming United (in 1539). Heaven protects the glorious Tang dynasty, greatness on our emperor. He honors scholarly study, searching out superior talent. With ceremony he takes 18 scholars into the Hanlin academy. Sometimes feted at the Red Stone Forest (in Kaifeng), positioned alongside of dukes and nobles. 19047.6 瀛州 Yingzhou says it was traditionally considered an island of immortals in the East Sea (further). 29425.13 翰林 Hanlin (not 漢林 Hanlin) and .21 翰林院 seem not to specify when this became an official term. In addition the central section ("main sound") of Guangling San has 18 sections. Also, some pieces had 18 sections in certain forms, such as Xishan Qiu Yue, while others expanded into 18 sections for their modern forms, such as Xiao Xiang Shui Yun. The reason for this is unclear. 2741.162 十八 shiba says of "18" only that it is a number or age. It gives two early references. The first says, "詩，小大雅譜：大雅十八篇，小雅十六篇，為正經 Small and Large Elegant Handbook (says), (When) Da Ya has 18 sections and Xiao Ya has 16 sections this is the correct classic." The second is to a poem by Bai Juyi. From 2741.163-185 there are 23 entries beginning "十八..." but none stands out as helping to explain why it was relatively common for longer qin melodies to have 18 sections. Perhaps for an answer one might try to find out why the emperor is said to have invited precisely 18 scholars. The inage above shows four sides of a ceramic pen or brush holder from Jingdezhen; the title is on the side shown here upper left: 十八學仕 18 Scholars. 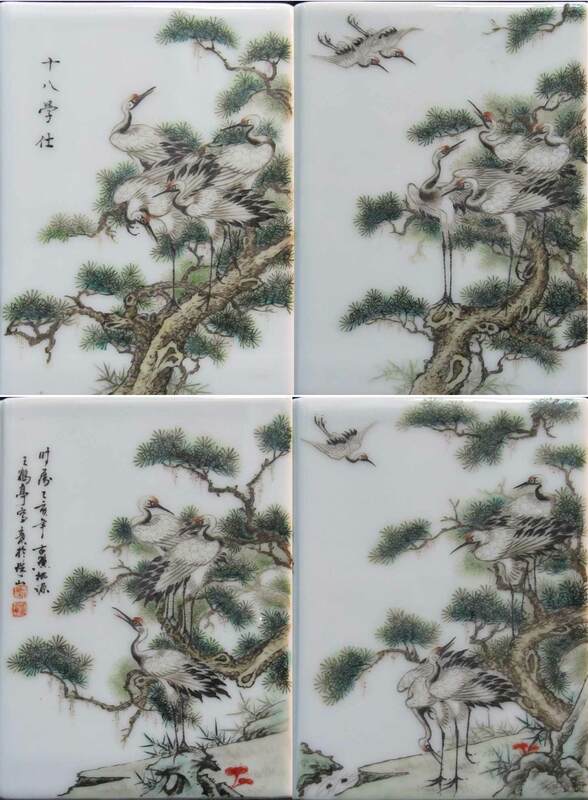 The ceramic piece shown below is from the same source. In Cantonese (the pronunciation of which is said to be closer to that of early Chinese than modern Chinese is) both "學 study" and "鶴 crane" are pronounced "hok"; in this context cranes can be called 鶴士 Mr. Cranes. For some good commentary on this in English see pp. 43-53 of Scarlett Jang, Representations of Exemplary Scholar-Officials, Past and Present, in Liu and Ching (ed), Arts of the Sung and Yüan; Princeton, The Art Museum, 1999. 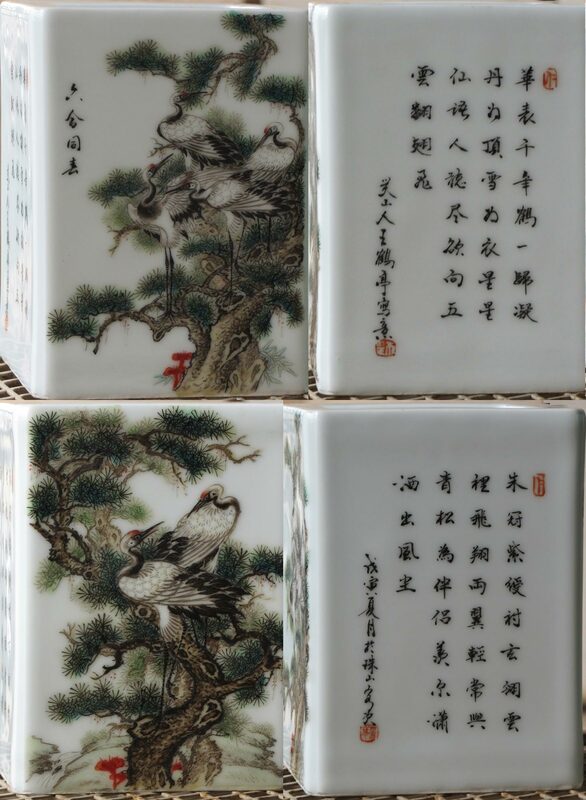 In contrast to the 18 Cranes at top and discussed here, the ceramic brush holder at right (also from Jingdezhen) has six cranes (2+4) on its four sides. Here the title is 六公同(套?) 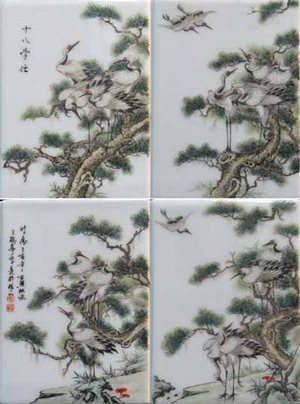 Six Worthies Form a Group: here 4 + 2 cranes stand for the 18. The text on the two of the other sides is not yet translated. 18 cranes as scholars is discussed above. Like 1530 in shang mode, but although the melody may be stylistically related it seems otherwise completely different (see jpg of tablature). The only version with commentary (see below). Shang mode; the version played here. Grouped with shang mode, melody quite similar to 1530 throughout. Grouped with shang mode but again very differfent: perhaps closest to 1525 but with lyrics. I have not yet examined all four versions in great detail. Normally I first learn the earliest version of any melody I reconstruct, but when I worked on this piece the general assumption was that Xilutang Qintong has been published in 1549. It was only later that I discovered that it was actually published in 1525. 19047.6 瀛州 Yingzhou, after saying it was traditionally considered an island of immortals in the East Sea, says to see further under 岱輿 Daiyu, then quotes 史記，秦始皇紀 the entry on Qin Shihuang in Shi Ji as saying it was one of three such islands, the other two being 蓬萊 Penglai and 方丈 Fangzhang. 8194.27 岱輿 Daiyu says it is 渤海東五仙山之一 one of the five mountains of immortals in the Bohai Sea, putting it just off the northeast coast of Shandong province (presumably around 嘗到 Changdao), but now some people claim that 岱輿 Daiyu actually referred to 釣魚台 Diaoyutai (Wiki: Senkaku Islands), a disputed island chain between Taiwan and Okinawa. Of these islands Penglai in particular is sometimes associated with the Eight Immortals (listed here, where they are distinguished from the Eight Dukes). There is nothing about the origins of the melody or anything that shows its connection (other than the title) with the other versions discussed here. The word-for-stroke pairing method means that the what is the last word sung in the two sections of the 1530 version become the first word sung in the ensuing sections of the 1539 version. In general, the pairing method and the variety of versions leave it unclear as to whether this piece is using a melody intended actually to be sung, at least as a qin song with these lyrics.